- CURRENT DAILY INTENTION (2015)! Spread the Love... my way! 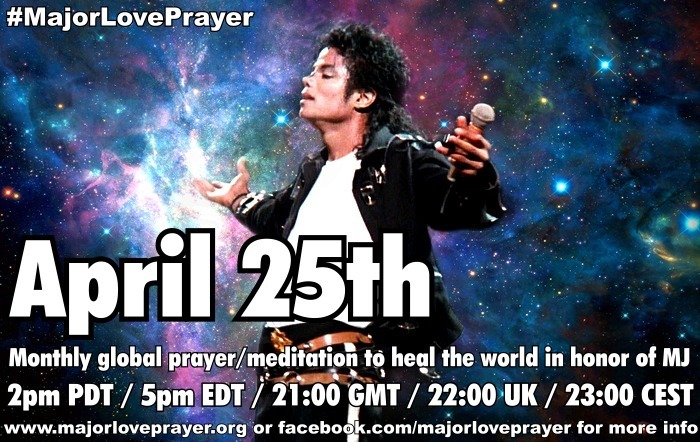 MLP is a simultaneous global prayer/meditation that happens every month on the 25th at exactly 2pm Los Angeles time. 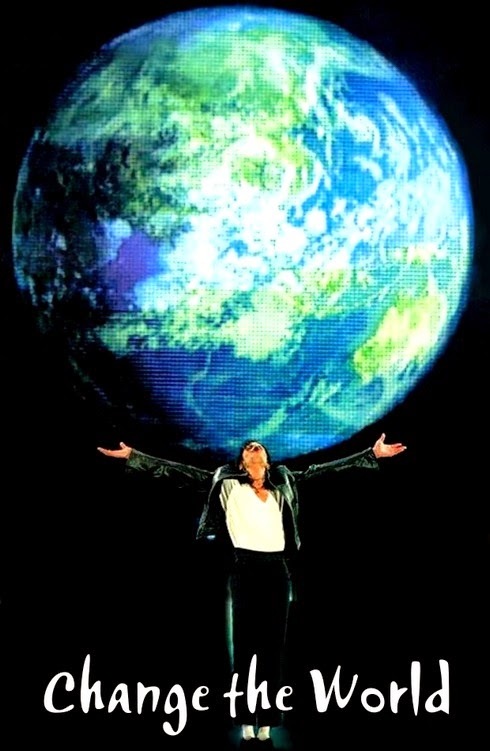 It began among fans on MJ forums in September of 2009. This website was started two months later to help spread the word and keep it alive. Since then, thousands have joined us in every language across the planet, together as one, uniting hearts and spirits in a focused effort to heal the world with the power and intention of LOVE and PEACE. Please help us by spreading the word and marking your calendars. Let's keep this going for always! Note: This is a fan website and it is entirely not for profit, with our only intent being to continue Michael's legacy of love. Thank you so much, everyone! Btw, becoming a dot is FREE! Posted in comments on oprah.com October 18, 2010 by 'SwiftHearts': -- "I recently heard of this interview airing and decided to get more information about it on Oprah's website. This is when I stumbled across this discussion and decided to share my story. I was diagnosed with a rare form of child bone cancer in 2000 at the age of fifteen. I was to start chemo therapy in August of that year. Not many people know this but Michael opened up Neverland several times each year for anyone to come and enjoy the park. Everything was free. Rides, games, food. A friend of mine who was a regular at Neverland called me one night and told me the park was going to be open for two weeks at the beginning of August that year. I asked my parents if they would take me the week before I was scheduled to start chemo. My doctors all advised against saying they feared I was too weak but I eventually talked my parents in to it. We had to drive what seemed like several miles after we went through the front gates of Neverland to get to where the actual park was with the rides. As we were driving down the winding road something came over me that I can't explain to this day. It was almost a feeling of peace. When my family and I stepped out of the car we weren't sure if we should check in with someone or really what to do. A man finally walked over to us and introduced himself and then explained to my parents how everything worked. We signed in with our names and other information and were given matching wrist bands and told we could ride anything we wanted, eat anything we wanted, play any of the games, etc. The man mentioned that on occasion Michael would come outside and say hello to everyone there. My parents thanked the man and within minutes I was at the top of the ferris wheel with my Dad. We rode it three times in a row and then it was on to the swings. We rode the rides for hours before getting in line to get some cotton candy and popcorn. As we sat down at a table with our snacks we noticed a crowd of children running all in one direction. I stood up on the seat of the table we were at but couldn't see anything. Several minutes later the crowd began moving towards us and it was then that I saw Michael. Standing under a huge umbrella and laughing as children were pulling at his arms, legs, and hugging him. My Mom then grabbed my hand and we made our way over to him. We introduced ourselves and my Mom told him what a wonderful time we were having. She then told him about my cancer and that I would be starting chemo the next week. When she said that Michael put one hand on my head and said, "God Bless you." When he touched me I felt the same feeling of peace and comfort that I did as I had when we drove through the gates of Neverland. He stood there and talked to us for a couple more minutes and then he left. I continued riding rides with my family and the other children but I couldn't stop thinking about meeting him. As we were leaving that night the man who we spoke to when we arrived stopped my dad and handed him a note. The note was from Michael and it was inviting the three of us to have dinner with him. Without hesitation my Dad accepted the invitation and the man then directed us to through another gate which led to the main house. I was surprised once we were in front of the house. I expected it to be this huge mansion but it wasn't. It wasn't small but it certainly wasn't huge. Several people who worked for him greeted us when we pulled up outside. We had dinner with Michael and his children that night and to this day it was the best night of my life. After dinner he asked my parents if it would be ok if he prayed with us and of course they said yes. I had never and still to this day have never heard anyone pray the way he did. At fifteen years old it made me cry. After he finished praying I opened my eyes and looked to each of my parents who were in tears as well. Michael was gracious enough to give us a tour of some of the things we weren't able to see earlier in the day. He showed us the arcade and the movie theater. The movie theater at Neverland was not your typical theater. Not only were there seats like a real theater, there were also beds for the children who were too sick to sit up. After showing us around we said goodbye to Michael and thanked him for everything. Imagine my Mother's surprise when she received a call from him several days later! We assumed he had obtained our number from the sign in sheet that we filled out upon arriving at Neverland. He asked her how I was doing and she told him I would begin chemo on Monday. He then gave her a number in which to reach him directly and asked her to please call him and let him know how I was doing around the middle of the week. She agreed. I went that Monday morning to the hospital prepared to begin chemo. When the doctor walked in the room he asked both of my parents to sit down. The three of us feared he was going to say the cancer had spread. They had run blood work and some more scans on me two days prior which is typical prior to beginning treatment. When the doctor began to speak he looked at my parents and said, "I don't know how to tell you this. I don't know how to explain this but Danielle no longer has cancer. There are no signs of it on any of the scans we just took." My Mom, my Dad, and I sat there and just stared at him and finally my Mom burst in to tears. We left the hospital and the first thing my Mom did when we got home was call Michael. I was embarrassed because she was crying on the phone but then she handed the phone to me to speak to him and it was obvious he had been crying as well. Through the years Michael remained in touch with my family and would call us several times a year on the phone to say hello. He would sometimes send us gifts and cards. I have been cancer free for ten years now. I can't explain what happened when I went to Neverland. It's defies explanation. I want people to know that I am not the only one who visited Neverland very sick only to become well after my visit. There are hundreds, if not thousands of us. Our stories were never made public because Michael didn't want that. He was a wonderful man. I have never met anyone who cared so deeply about not just children but people in general." SAINT MICHAEL JACKSON, OUR BODHISATTVA OF COMPASSION AND LOVE! The only word that comes to mind after reading this is SPEECHLESS. What can I say, Michael? I love you!! i'm deeply touched and glad that you shared that with us - thank you! I have no words to describe the JOY I feel inside. thank you for such a wonderful post. That's our Michael ... the one we know so well. God bless Danielle for telling her inspirational story so beautifully. Thanks to Be God's Glow for offering it to us. Thanks to Michael ... just because he is Michael ... there is no other way to say that, I don't think. I may have to use this story for a post on my website. Be God's Glow, are you in contact with the author? Would she mind if I used her story as a starting point? Hi Jan - I emailed you back. I don't have any contact info other than her profile (linked in the post above). Just beautiful, isn't it? Our angel Michael. Oh, God bless you, Michael! Another story from comments on the same article! MandyandKyle : Michael told me a story one time about going in to an orphanage in Russia where the children were laying in beds with sheets covered in urine. He said the smell of urine was so strong when he wa...lked in to the building that it made him sick to his stomach. He had his people get on the phone to the President of Russia and he told him that if each child in that orphanage was not bathed, he would not put on the concerts that he was scheduled to put on that week. The President told him he had no idea things were that bad at that particular orphanage but he assured Michael things would be "taken care of." Michael said he responded by saying, "Was it that you didn't know or you didn't care to know?" And he said there was just dead silence on the other end of the line and that told him all he needed to know. Then he said he told the President that he was sending one of his people out to buy clean sheets, mattresses, and toys for every and that he would remain in the orphanage until each child had been bathed and was wearing cleans clothes. The President then asked him if he was going to cancel the concert planned for that night and he said, "I suppose that's up to the people here and how long it takes them to give each child a bath. Right now, these children are my priority." MandyandKyle : All of the children ended up getting bathed and the show went on as scheduled. He said he went back to the orphanage the next day and the children all seemed well and were playing with all of their new toys. He said he knew that once he left things would probably go back to the way they were before but that at least for a few days he made things right. That, right there, is the difference between Oprah and Michael. Thank you so much for sharing this story. Since I have made up the decision to completely boykott Oprah (just imagine: Oprah is on air and nobody watches....)I would not have come across this very, very beautiful story. God bless to all of you. When Michael prayed for healing he believed . Believe in miracles. Pray with love in your heart . What a beautiful story. It brought tears to my eyes. If only the public knew more stories like these of Michael. Even Gavin Arvizo was healed of cancer by Michael's love. But nobody remembers that. Saint Michael Prince of Peace! Arch Angel Michael, the people’s angel. that’s who Michael Jackson was to me. I can imagine him praying as natrually as to sing a song. His messages are so solidly based and entrenched in our hearts that nothing can ever move them. That’s saintly. That Michael. What a beautiful story. Gavin also came to my mind. Immediately. God works in mysterious ways; perhaps a confession of sorts to the greatness that even he knows that Michael Jackson was, is and always will be. I also sent to my page on FB . It's called " mediunity ", which means , when a person is the intermediary of some powerful Healing Energy, that (of course) comes essentially from GOD ! All Healing comes from the Source of Universal LOVE ! Michael knew that He had this Gift ! That's why He was so adamant in visiting Hospitals ! He didn't want to talk about His Gift because of His shyness and humbleness . He didn't want people saying He was bragging about having " power of Healing " ( imagine what the dark press would say...)! But He knew... By some clues in some of His lyrics ( revisit " CRY " ). Pay attention on how He always " touches " the sick people He visits with at the Hospitals . Also , He gets very disturbed , when there is people filming Him , during these occasions. He doesn't like to be doing His acts of kindness as a " show ". This is typical of the saint mediums( as Jesus said to give for free what was freely given to you ). He Is Our Angel ! L.O.V.E. Nora . beautiful story...i also shared it on my FB and thought of gavin..mike helped him and he did a bad thing to him..i cried a lot while reading this,mike wasn't a regular human being..his love made difference and had powers of healing..coz his heart was pure and huge'all about him was love&caring for others...i miss&love him so much!! This story, just brought me to tear. I always knew Michael was Angel and just stands the point more. 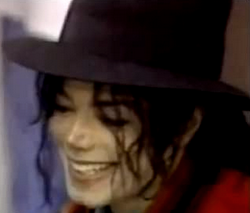 Each thing I read or watch about Michael of his acts of kindness from his heart, makes me more and more in love. This site was created and is maintained by Michael Jackson fans and is entirely not for profit, only for LOVE! We're sending out a major love!